Even Herjavec, known for competitive Ferrari racing, is surprised he’s signed up for a celebrity dance competition. Craig Sjodin / ABC Amateur dancer Robert Herjavec is partnered with pro Kym Johnson on the upcoming 20th season of Dancing with the Stars. That was Kevin O’Leary’s reaction when he heard Robert Herjavec was going to be a contestant on Dancing With the Stars. The reality competition returns for a 20th edition March 16 on ABC and M3. For six years, the two venture capitalists have been swimming in the Shark Tank and before that they snorted at each other on Dragons’ Den. This is one time, however, when Herjavec will dance alone. Even Herjavec is surprised he’s signed up for a celebrity dance competition. He’s never had any dancing experience and admits he’s the guy who always stayed bolted to his chair at weddings. ABC likes to feature its own stars among the celebs and Herjavec’s name came up. The Canadian businessman checked out the ballroom last season, taking nervous note of the 600 spectators. At 52, he’s in top shape and the Shark Tank production schedule was a perfect fit for this two-step. Tipping the balance was the fact that DWTS was his late mother’s favourite show. “She liked Shark Tank and she liked Dragons’ Den, but Dancing With the Stars, that was a big deal,” he says, wishing she were still around to see him become the dancing Dragon. 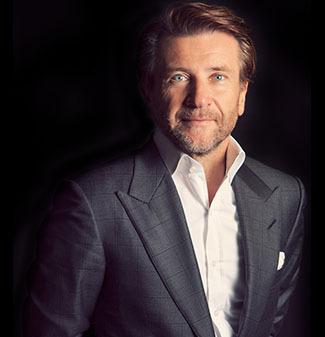 Herjavec’s own rags-to-riches story would make a good miniseries. His family fled what was then Yugoslavia in 1970. He’s a self-made man, so if you don’t think he’s in it to win it, think again. “I’m a pretty extreme, go-for-it guy,” he says. Once he said yes, he started training. Herjavec is an avid runner and golfer, but he’s added weight training after speaking with former contestants Hines Ward, a former NFL star and DWTS champ, and fellow Shark Mark Cuban. The two began rehearsing up to eight hours a day the Monday after the Oscars until Herjavec got a little carried away. After three days, Johnson tested him with a tricky move, which he nailed in his first attempt. “Of course, it went to my head and we tried it a second time, and I kicked her so hard she needed a medic,” says Herjavec. He figures he has a shot given the competition. While the entrepreneur cleared much of his schedule, the one thing he insisted on continuing to pursue was racing competitively in the Ferrari Challenge series. Herjavec won the season opener at Daytona and has a shot at the championship.